Part of a complete system for simplifying and maintaining proper water chemistry in very small (e.g. “nano”) reef aquaria. 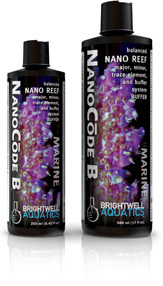 NanoCode B provides molecules that increase pH stability and form an integral part of aragonite, the mineral that is secreted by reef-building organisms. Used in conjunction with NanoCōde A, promotes stable water chemistry and improves rate of biogenic aragonite formation. Small reef aquaria offer numerous benefits and challenges to their husbandry. Their compact size affords the ability to create a densely-stocked coral and/or sessile invertebrate assemblage for a modest investment of time and resources, equates to a savings in utility bills relative to the requirements of larger systems, and makes placement of a flourishing captive reef biotope into rooms with limited space a simple matter. The primary challenges associated with caring for small reef aquaria are maintaining proper nutrient concentrations and resisting the temptation to overstock, overcrowd, and overfeed the system. Nano-reef aquarists will agree that a primary goal is to encourage the growth of the corals and other reef-building invertebrates being housed, and the relative rates of growth are largely dependant upon the availability of elements such as calcium, magnesium, potassium, and strontium, as well as upon the alkalinity being maintained within the proper range. Used in conjunction, NanoCode A & B provide the afore-mentioned elements, as well as the molecules forming the basis of alkalinity, in ratios that encourage the production of aragonite. NanoCode A also provides non-conservative minor and trace elements in natural seawater concentrations to help simplify the maintenance of inorganic water chemistry in nano-reef aquaria. Neither NanoCode contains organic components such as vitamins, amino acids, etc., as these should be dosed separately (indiscriminately dosing these substances with a supplement meant to address high-biodemand elements such as calcium, or alkalinity, could lead to overloading the system with latent organic material, causing water quality to suffer; also, the rates of bio-uptake of the organic and inorganic components would need to be equal in order to avoid an overdose). Basic: Shake bottle well before using. Add 5 ml (1 capful) of product per 10 US-gallons of aquarium water daily or as needed to maintain the alkalinity within a range of 7 – 12 dKH. When used in this fashion, 250 ml treats up to 500 US-gallons (1,893 L). When used in equal amounts with NanoCode A, the calcium and carbonates being added are in the same ratio found in natural seawater. Do not mix NanoCode A & B in the same container; this will cause the active components to precipitate and become ineffective. Allow 60 seconds to pass between dosing NanoCode A & B. Advanced: Determine the alkalinity in the aquarium using an accurate test kit before supplementing. Shake bottle well before each use. Each ml of Brightwell Aquatics NanoCode B will increase the alkalinity in 1 US-gallon (3.785 L) of water by approximately 1.67 dKH (0.60 meq/L). If the initial alkalinity in the aquarium is below 7 dKH (2.5 meq/L), add this product at the maximum rate of 5 ml per 10 US-gallons daily until the desired alkalinity is attained, then dose daily or weekly as needed (see below). Note that each aquarium has different requirements for calcium and carbonates (which largely constitute Alkalinity or Buffering Capacity, hence pH-stability); therefore, it is not uncommon for unequal amounts of NanoCode A & B to be required for obtaining and maintaining the desired calcium concentration and alkalinity. To determine the daily dosing rate for alkalinity maintenance: estimate the volume of water in the entire aquarium system; divide the daily decrease in alkalinity by 1.67 (when measuring alkalinity by dKH; divide by 0.60 when measuring by meq/L); multiply this number by the volume of water in the system to get the daily dosage required (ml) to maintain a stable alkalinity.